Bay School faculty Craig Butz and David Friedlander-Holm spent Summer 2017 preparing a flock of four weather balloons that were launched into the path of the total solar eclipse over Madras, OR on August 21st. Between 2010 and 2013, students at The Bay School of San Francisco successfully launched and recovered four near-space balloon payloads, sailing into the stratosphere and returning atmostpheric data, photos, and video. 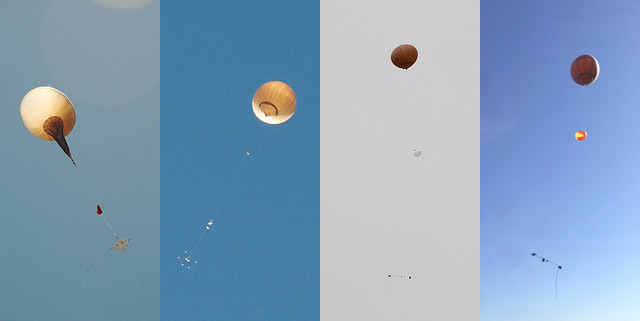 Our first mission in May of 2010 proved that we could successfully launch and recover video and data from the upper atmosphere. Refining our first design, Ikaros II tested new components and a multi-package arrangement. With a new, lighter, more stable payload, including electronics we constructed ourselves, Ikaros III tweeted its way to 96,000 feet on April 11, 2012. The flight of Ikaros IV, configured with better cameras, data-logging capability, and a bacteria collection device, was completed on April 11, 2013.